We are grateful to Ken Rooney, William Temple in The Fountain and Donnie Sweeney, and those in Top of the Hill 2010, in Gobnascale for their assistance in the field. Denis McCoy and Brendan Murtagh's advice on questionnaire design, and the operation of the survey was invaluable. Thanks to Alan Breen and Mike Morrissey for statistical advice, and to the staff in computer services in the University of Ulster, Magee College, especially Trevor McMullan, for their assistance. As always, thanks to George Row for further informatics back-up. Denis McCoy's advice on data presentation also helped in the preparation of this report. We are grateful to the Physical Social and Environmental Programme of the European Union, The Joseph Rowntree Charitable Trust, The Ireland Fund, The Londonderry Initiative of the Department of the Environment, and the Central Community Relations Unit for core funding for the project. We would like to thank the residents in both The Fountain and Gobnascale who consented to be interviewed and who read transcripts of their interviews. They provided us with the basis of the questionnaire for the survey and we have been privileged by being welcomed into their homes and community centres. We would also like to thank the many more people in both areas who participated in the survey. These people - whose names we do not have - have given their thoughts and opinions to us, and it is of these that the survey is composed. From 1993, a group of people began meeting to discuss various aspects of political life in Derry or Londonderry city. We worked together to develop a project which addressed the issues related to segregation, the movement of population within and out of the city, and the quality of life in enclave areas. 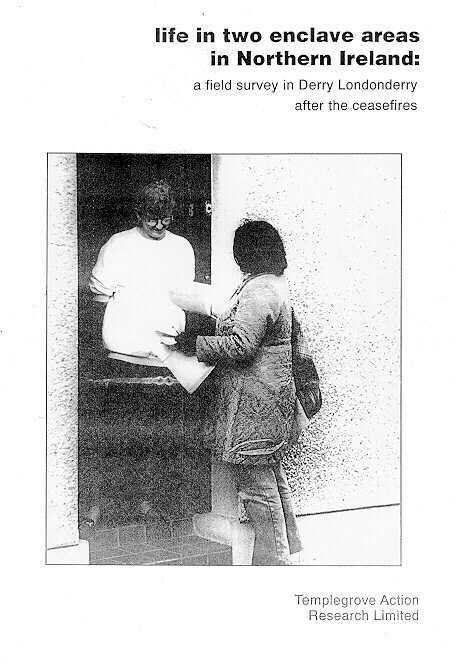 In September, 1994, Templegrove Action Research Limited, a community based research company with directors drawn from both sides of the community, began a two year action-research project on aspects of segregation and sectarian division in the city. Funding had been obtained, and I had received a two year leave of absence from the University of Ulster to work full-time on the project. Just as the project began, the IRA, and shortly afterwards the Combined Loyalist Military Command, announced cease-fires. By early 1995, the two other members of the team, Ruth Moore, and Pauline Collins, had been recruited. In our research on segregation and enclave communities in the city we have come to refer to as Derry Londonderry. Our work has been based in two enclave communities: a Catholic community in the previously predominantly Protestant Waterside area of the city, - Gobnascale or Top of the Hill; and a Protestant enclave, The Fountain, in the predominantly Catholic Cityside area. Our research field had been substantially altered by the cease-fires. We had planned the Templegrove research project when the violence of the troubles had been ongoing. That the violence should end just as we were beginning work was a challenge to our ability to respond to a changing political climate. Sectarian division and violence did not merely provide the backdrop to our research, they were central concerns, and at the very beginning of our work, this major change had occurred - apparently the violence had ended. This cessation of violence seemed laden with significance, not only for our work, but for our daily lives, and for the country as a whole. We engaged in a range of activities throughout the period of the project, and these are fully documented in the other publications generated by our work. A list of these is included as Appendix 1. This field survey was conducted as the second phase of our work, the first being a series of in-depth interviews in each area. These interviews provided the basis on which we based our questionnaire design. The survey collected an enormous amount of data, and we have restricted ourselves to a basic reporting of the data here. Secondary analysis of the data would no doubt yield a more detailed picture, but that must take place at a later stage. In order to remain within the time boundaries of the project, we present here the initial findings of the survey, as a way of pointing to areas of further work. Examination of census and sample data found a different settlement pattern in the two areas, with the Gobnascale area experiencing an influx of people in the 1970's associated with the building of new housing. The Fountain, on the other hand, has experienced a steady decline in population, particularly apparent in the mid to late 1980s. A new wave of inflow to the area is currently being experienced with an estimated 6% of Fountain residents having been there for a year or less. The two communities are virtually religiously homogenous, but both contain a small minority of residents from the other community. Comparisons between the sample and the census data for each area suggest that there is an over-representation of females in the Gobnascale sample, which may not be found in the Gobnascale population. Age data show that 25% of the Fountain population was over the age of 60 in 1991, and 17.5% of the Fountain population are females over the age of 60, whereas 42% of the Gobnascale population was under the age of 19 in 1991. The predominant housing stock in both areas is public housing, although the Fountain has a significantly larger privately rented sector. Data on household size suggests that well over 40% of households in the Fountain are single person households, whereas households in Gobnascale tend to be larger, and more Gobnascale households contain children under the age of 18. Around 75% of those surveyed felt that they had a free choice in staying or leaving the area they live in, although a slightly lower percentage of Fountain residents felt that this was the case. A greater proportion of Gobnascale residents indicated that they intended to move in the near future, and the most frequently taken measure to facilitate a move is to apply for a housing transfer. Most decisions to move in both communities were made as individual decisions, although a small number of people felt they had to move because of dogs, vandalism or other nuisances in the area. Differences between the two areas in factors which influence decisions to move emerged. Availability of suitable housing was a major factor for Gobnascale residents, while proximity to the town centre was a major influence on Fountain residents. Troubles-related factors which influence decisions showed marked differences between the two areas on matters relating to policing. Gobnascale residents were more likely to be influenced by troubles-related factors in their decision to stay or leave, whereas the need to defy intimidation and protection by the security forces were reasons to stay for Fountain residents, which tended not to influence Gobnascale residents. Although 70% of Gobnascale residents and 77% of Fountain residents surveyed saw their area as segregated, 18%-19% in each areas did not. By far the most agreed statement about segregation was that a segregated community is a sitting target for sectarian attacks. Segregation also means a freedom to express your own culture and provided freedom to speak your own mind. 38% in both communities thought that segregation brought the community closer together. Negative aspects of segregation examined were the loss of natural friendships and lack of understanding of the other community, although significant differences emerged between the two areas on these. The majority of people in both areas had contact in their families, neighbourhoods and social life with people from the same community as them, although there some evidence of more mixing between Fountain residents and the Catholic community than among Gobnascale residents and Protestants. On attitudes to the movement of Protestants out of the city, significant differences were found between the two areas in all but the "don't care" responses. The majority of residents surveyed in both areas were satisfied with life in their area, although more Gobnascale than Fountain residents thought that their area had improved in the last three years. Conversely, fewer Gobnascale than Fountain residents felt their area had deteriorated in the last three years, and Gobnascale residents were more optimistic than Fountain residents about the prospects for improvement in the next three years. Factors which influenced residents to stay in both areas were the significance of the area to their side of the community, and local churches and institutions. Differences between the two areas were found in the influence the historic past of the area had on decisions to stay, roots in the area, and the attractiveness of the area. Lack of facilities for children and handiness of amenities emerged as important in both areas. Car parking and traffic problems emerged as important for Fountain residents in particular. Variations were often related to materially different conditions in the two areas. 36% of Gobnascale residents surveyed and 58% of Fountain residents felt part of a minority. Those surveyed tended to refer to the context of the city, rather than the context of the country or the island when defining whether or not they felt in the minority. The two areas divided sharply along predictable lines in selecting identities such as Unionist, Nationalist, Protestant and Catholic, and the only position that was equally if rarely chosen by both sides was 'Northern Irish". When asked about problems of access, both areas reported difficulty in accessing facilities for children, but Fountain residents had fewer access problems than Gobnascale residents. There was agreement between the two areas that shootings and bombings were no longer a problem, but had been in the past. Divergence occurred between the two areas in relation to their experience of the police and security forces, with Gobnascale residents more likely to perceive the security forces as a problem. The biggest problem for Gobnascale residents was paint, stone and bottle throwing, whereas the biggest problem for Fountain residents was vandalism to cars and property. Desired improvements in both areas include improvements to housing stock, vacant dwellings and land put to use and improvements to the environment. Community relations issues, such as more contact with the other community ranked fourth in both areas. The most serious problem facing the residents in Gobnascale was unemployment, they felt, whereas Fountain residents felt that their most serious problem was lack of amenities for children and young people. Secondary analysis of these data could usefully explore a further age and gender breakdown of data, in order to explore sub-groups within each community. When we analysed the figures from the survey, we used statistics to test whether the differences between the two areas were due to more than chance. In order to do this, we used SPSS 6.1, which is a package of computerised tests. The main test we use here is called the "chi square". This test will tell us whether, in all probability, the differences between two sets of figures are accidentally different, or whether they are systematically different. For example, it is unlikely that there is a systematic relationship between the number of rainy days this year, and the sale of eggs, but there might be a systematic relationship between the number of rainy days and the sale of umbrellas. Running a chi square on a two sets of figures, one on umbrella sales and the other on the number of rainy days will show if there is a statistically significant relationship between them. In this report, we describe the level of significance as well. If the result of the chi square test is larger than .05, then we say that there is not a statistically significant relationship. If the chi square is .05, then there is only a 5% or a "one in twenty" chance, that the differences we observe in the two sets of figures are accidental. If the chi square is .04, or .03, then the relationship between the two sets of figures is even less likely to be by chance, and the " statistical significance" is greater. However, two notes of caution. We have done a large number of comparisons here, and no matter how well we test the data, the more data we test, and the more tests we do, we increase the probability that some of the results will arise by chance. Since we have tested roughly 190 variables here, which is roughly 190 tests, then we can estimate that 9 of those tests (1 in 20) show chance results. For example, one statistician many years ago came up with a highly statistically significant relationship between the number of storks in the country one year, and the birthrate. His calculations were impeccable, and there really was a statistical relationship there. However, common sense would tell us that there is no causal relationship between one variable, - the number of storks, and the other, - the birthrate. So, this report should be read with a critical eye, and a large helping of common sense, bearing in mind that statistics, too, have their limitations. Finally, one further point about the use of our results to support arguments or causes. Given the complexities of the issues we are dealing with, any figures which others wish to use elsewhere should be placed in the context of the wider findings of the surveys presented here. It is sometimes tempting to select the statistics which support our pre-existing ideas, and ignore those which challenge them, or are ambiguous of contradictory. However, the nature of the issues we have studied here is often ambiguous and contradictory, and to present them as straightforward or simple misrepresents their richness and complexity.